Several books have come across my desk that I’d like to write about briefly. The first is Beyond Literary Analysis by Allision Marchetti (@allisonmarchett) and Rebekah O’Dell (@RebekahODell1). As I’ve written about these writers and what I’ve learned from them in the past on this blog, particularly around infographics. I’m a huge fan of their work and the Moving Writers blog. When I learned that they were writing a book about literary analysis, I flipped. After over twenty-one years as an English teacher, most of the them teaching courses like AP Literature, English 102, and IB English Literature HL, I’m starting to feel pretty spent teaching literary analysis and explication. Knowing that their book was coming, I had a feeling that I’d be rewarded in the reading, and be given ways to breath new life into analysis for students and for myself. That feeling proved true when the book arrived and I dove in. Full disclosure, I started the book on the beaches of Playa Mujeres, just north of Cancun in Mexico during winter break. I wasn’t going to work over break, but I just had to read this book. In writing my review I might be experiencing a strange synthesisia of white pages, good writing, sunscreen and cilantro. If you are familiar with Marchetti and O’Dell’s work you know that they preach the gospel of the mentor text. Not familiar? Well, the concept is simple enough. Have students read the work of professional writers, identify the moves made by these writers, and work to replicate it in their own work. Makes sense, no? 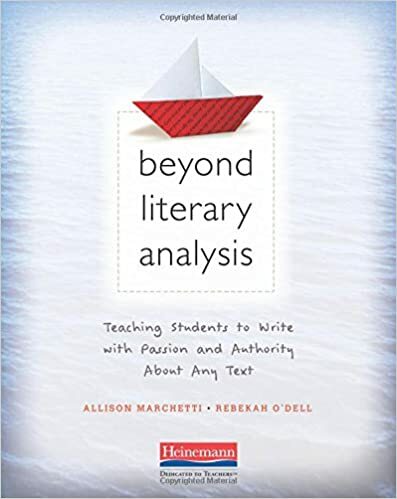 Beyond Literary Analysis is broken into three main sections, making for clear reading when reading from cover to cover, but if you are looking to surf the book, each section provides distinct information. First, Marchetti and O’Dell redefine analysis into 4 simple parts. Second, this book is practical. They focus on the common issues found when working with the four parts of analyssi in student writing, provide a chart of these issues, and then activities for each of these issues. Each of the exercises or protocols to improve writing is described on a later page. In the third part of the book, there’s a close look at specific analysis assignment with different kinds of texts. Throughout the book, these writers give lots of examples of student work and the moves that writers can make. Excellent models to use when working with students. I’ll be honest. This is a book that I’ll reread over the summer, and put into action next year. While certainly, the strategies provided can be a savior when you are looking for dealing with a problem tomorrow, what I love about these writers is that they approach the concept of mentor texts as an entire driving philosophy that makes for good writing program. My IB kids are 5 weeks away from examining. We’re engaging in full on-slaught exam prep, so looking at analysis in NPR blogs or Radio lab podcasts isn’t where I’m going to focus my energy. Still, these teachers give us a way of approaching a curriculum and working with students over months. Plus, I’m thinking about bringing back reading-logs. I want kids reading and reflecting and engaging in mentor text work on a regular basis. The sustained change in the practice of teaching analysis and getting kids to produce it, i’m not looking for the Friday bandaid. I want to practice in sustainable change. While I hated reading-logs when I first started teaching, and quickly abandoned them, I want students consuming input on a regular basis and reflecting on what they are learning about these texts as writers. Some form of reading-log combined with blog post may be a way to do this. 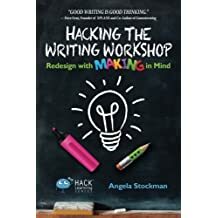 I also got to read Angela Stockman’s (@AngelaStockman) Hacking the Writing Workshop. I’ve been into Stockman’s work for a couple of years now since I read her first book. Stockman is very accessible on Twitter and friendly at Edcamps. Like other books in the Hack Learning series, Stockman’s new book offers concrete suggestions both in the book as well as with QR codes, which take the reader to shared Google Drive folders with additional resources. Reading this book was a multimedia extravaganza where I read and highlighted the book, and zapped QR codes on my Chromebook. If you are looking to start a workshop, or looking to reinvent what you do currently, this is the book for you. Here at Canandaigua Academy, we are slowly working to redesign one of our classrooms to be a project-based, learning space with flexible seating. Stockman’s book will help us elevate that space into a room that works to foster productive work for students. These books are made by writers who get the teaching profession. I believe they know the needs and temperament of the weary, March-drained teacher, much because I suspect that they live these lives themselves. As such, these books are straight-forward, practical, and give you stuff to work with immediately, if that’s your need. 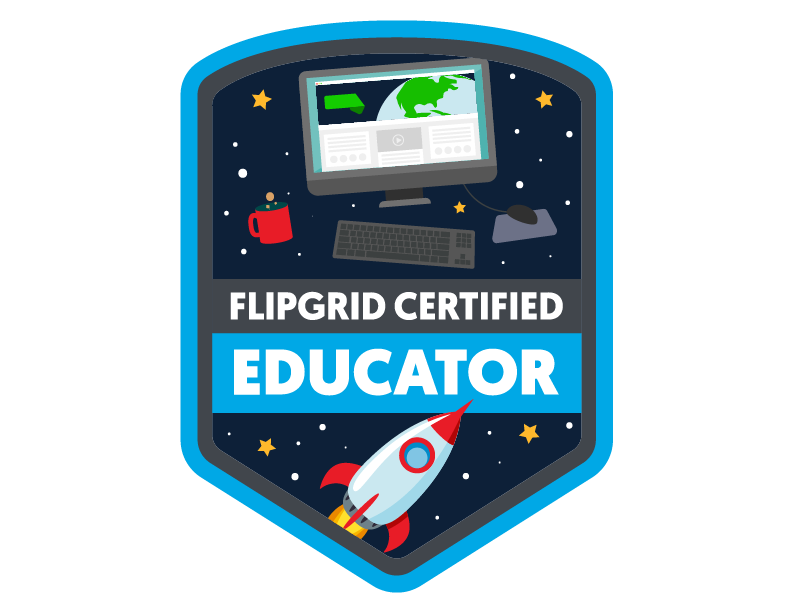 This entry was posted in Uncategorized by kpedzich. Bookmark the permalink.